Tad Coffin grew up on New York’s Long Island during the 60s and early 70s. He started riding at age 10 on the family farm, riding in Meadow Brook Hounds Pony Club, fox hunting and competing in equitation, junior hunters and jumpers. His interest in combined training developed in high school and he was selected for training at the USET with Coach Jack LeGoff in 1973. 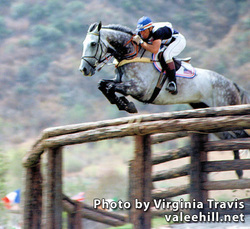 Riding the mare Bally Cor, Tad won individual and team gold medals at the Pan American Games in Mexico in 1975 and repeated this success at the Montreal Olympic Games the following year. Tad became involved with saddle design in 1976 when he was approached by Miller Harness Co. to endorse an all purpose saddle for event riders. The popular Crosby Lexington TC was the result. In the late 80s he developed another best seller for Millers, the Equilibrium close contact saddle, also manufactured by Crosby. A quest for improved saddle performance led to an extraordinary period of research and development for Tad at his farm in Charlottesville, Virginia. in the early 90s. The result was a new saddle, a new company and a new and very innovative manufacturing process. In partnership with his long time friend and horseman Justin Kenney, Tad’s saddles have gained immediate popularity with many of America's top riders. Tad and his family live on their farm outside Charlottesville, Virginia. Don grew up in the horse industry as the son of the Owners of Cherry Meadow Farm School of Horsemanship in East Northport, New York and a member of Meadow Brook Hounds Pony Club. As a competitor, he went on to represent the United States as a member of the USET in international competition. As a coach, he has trained Olympic level riders around the world. He has over 50 years of full time experience with horses, 40 of those as a professional. He works with dressage and event horses, as well as hunters and jumpers. He has designed many arenas, facilities and event courses, built them himself from the ground up, and worked in literally hundreds of locations around the world. Level IV Certified Instructor, USEA More importantly, Don was one of the four "Guiding Minds" in the development of the ICP curriculum, USEA Instructors Certification Committee, Workshop Faculty and one of 4 original Assessors for the program. More importantly, Don was one of 4 creators of the ICP curriculum. Bernie has reached the top in all three of the traditional Olympic Equestrian Disciplines: Show Jumping, Dressage and Eventing. In 2009 he was inducted into the National Show Hunter Hall of Fame. As a Junior, he won both the AHSA Medal and ASPCA Maclay Finals. Eight time Olympian J.Michael Plumb is originally from Syosset, New York, and got his start with the Meadow Brook Hounds Pony Club where he earned his "A" rating. He began his career competing three-day horses with the 1959 Pan American Games as his first international competition. Since then he has been named to a record eight United States Olympic Teams, marching in more opening ceremonies than any other olympic athelete, equestrian or otherwise. He is the first Equestrian to be inducted into the U.S. Olympic Hall of Fame. Mike has tallied 6 Olympic medals, including Team Gold in 1976 and 1984, Team Silver in 1964, 1968, and 1972, and the Individual Silver in 1976. Ironically Michael and Bernie grew up in the same town in Long Island, and went to the same Pony Club, the "Meadow Brook Hounds".